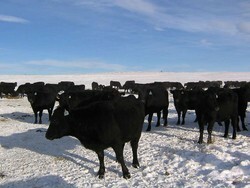 These yearlings were really curious at what we were up to at the fire scene. They kept wandering around getting in the way. The Hired Hand said they were wondering why they weren't invited to the barbecue. Taken 8/6/2007. Too much excitement around here for me. Monday afternoon the hired hand come running home saying there was a fire. Boy he was excited about it. We went running over to see where it was and what we could do. I told My Darling Wife I didn't want to call it in yet because I wasn't sure where it was. The hired hand wasn't making much sense. I kept looking over to where he said the fire was and I couldn't see no smoke so I figured it must be pretty small. We finally got to where we could see the smoke and fire and it wasn't to big and I figured we could get a handle on it. I started up the sprayer and had the hired hand drive and we took off to spray down the fire and get it under control. We didn't go very far and all of a sudden the wind came up and off to the races the fire was, running out ahead of us at a fast and furious rate. About this time the hired hand was having all kinds of trouble with the pickup. The clutch wasn't working right. He couldn't get it out of gear, was having a hard time getting it into gear and one time when it dies, it barely wanted to start. With pickup trouble and the fire running with the wind I decided to radio home and have My Darling Wife call for help. She called the different fire agencies in the area and the neighbors to come give us a hand. I then tried to figure out what was wrong with the pickup. It was real easy to figure out, the hired hand had overheated the engine. We were idling along spraying out fire and he had the air conditioner on which causes my pickup to overheat. I popped the radiator cap and watched the steam plume all over and filled it with water from the sprayer and we were off again with stern warnings about the a/c and radio staying off. At this point I backed off and regrouped. The fire was really going so I had to come up with a plan. 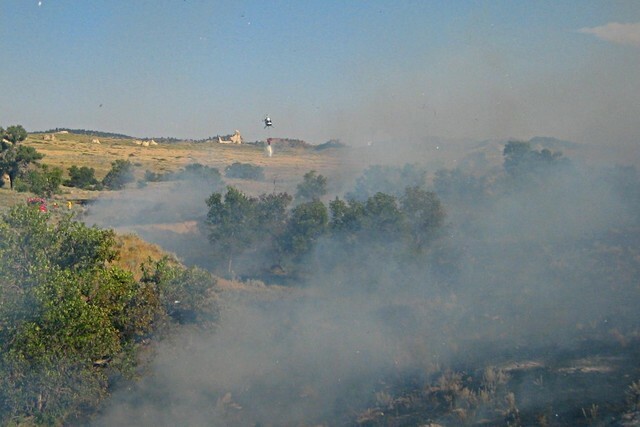 I started by trying to get the west side of the fire out up to the alfalfa fields. There was a couple miles on the east side before the fire found any timber but we were all ready only about 100 yards away from timber on the west side so I wanted to keep it out of the timbered hills. That's really hard to fight once its in the timber. I just was getting that done when the helicopter arrived to start helping. Boy was I glad to see it. That meant more help was coming. The wind had died down by now so it wasn't to bad fighting the fire and we kept working around it as more and more people showed up and we all got it shutdown. What a relief. Was I ever exhausted by this point. It's amazing how hard a person can work when doing something like this and not even relize it. My throat still hurts from the smoke I inhaled. At times it was so thick that I couldn't see or breathe very well and it really got to my lungs. That's what happens though. 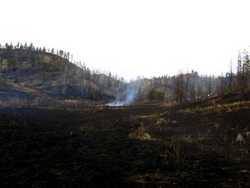 It burned around 50-75 acres of grass. The hired hand and I have been taking turns sitting on it making sure it is staying out. Put out any smokes we see and monitor the situation. I am feeling pretty comfortable that it is out now and we can relax a little. Now if I just don't get any more thunderstorms around here. That's how we figured this one started, we heard some thunder of rumbles on Sunday night so there must have been a strike that we were not aware of. Hoping for no more. I would like to thank everyone that responded. Neighbors, county, BIA, all the help was appreciated to stop this. We had a little fire yesterday and I truly believe this helicopter saved the day for us. We got it under control and only burned about 50-75 acres. The next couple of days will be busy with short nights and long days watching the fire cool down and not leave its containment. Taken 8/6/2007. With the cooler weather so far over the weekend they made some progress on the Derby Fire but it looks like that is in Jeporady now. More than 200 homes were being evacuated Sunday night on the western flank of the fast-growing Derby Mountain fire. Fire officials feared that winds and warmer temperatures in the coming days will create "extreme" fire conditions on the Derby fire, which had grown to 180,000 acres by Sunday night and was considered 20 percent contained. The fire is burning fiercely, and sometimes erratically, including a burst of about 3 miles in an hour Sunday afternoon. The story talks about how temperatures are expected to climb for the next few days and the humidity is going to drop so expect problems. These fires really get going in those conditions. Factor in some wind, which this area is famous for, and it could get explosive. There are a lot of people and animals in the area that I am thinking about. Factor in the Firefighters working hard to control this and there is a lot of things to pray for. Let's hope they make some progress and it doesn't make any more huge runs like last week. There is an RSS feed available on the page to keep up on the announcements and news. I note the maps available are a few days old and I don't know when new ones will be available but I assume there will be some updated ones eventually. They are working at putting out the fire and sometimes the information doesn't get distributed to the public as fast as we would like to see it. Let's not criticize them for not being fully up to date and try to understand the stress they are under fighting this. A really bad fire near Big Timber/Columbus. I note the map in the paper appears to be a little out of date. The reading I have been doing is that there is a pre-evacuation order out for Reedpoint and another one for the areas all the way up to Columbus. It just shows how dry it is out there. I can't help but thinking if the fire was running with winds of 50 MPH, how many cattle and other critters were lost? 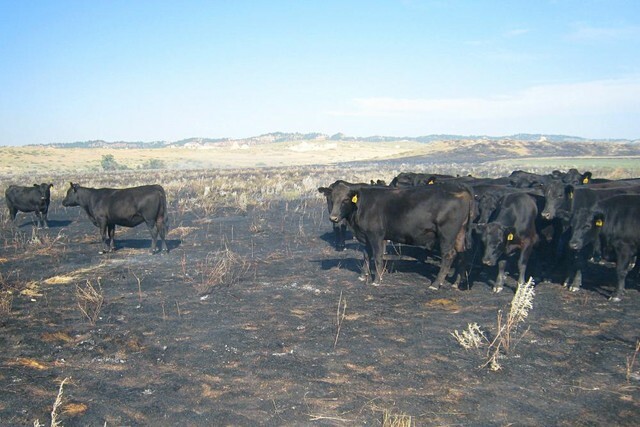 How many ranchers are getting burned out? Everybody always talks about all the homes in danger. I see the ranchers getting hurt. Is that wrong of me? The weather forecast doesn't look real promising for getting this under control. Cool today but then slowly warming up and no real chance of moisture. Bad situation. A thunderstorm that blew through Billings on Monday night toppled trees and power lines and sparked a series of lightning-caused wildfires. 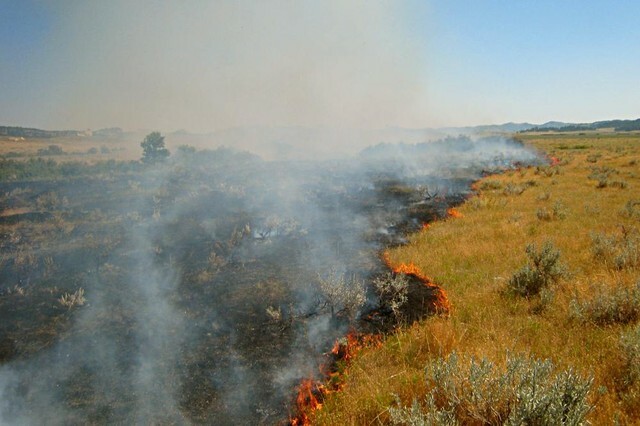 One fire, near Sacrifice Cliff, blackened 40 acres where a cluster of transmitter towers sits at a site off Coburn Road, said Mark Heppler of Billings Interagency Dispatch. The blaze, called the Four Dances fire, did not appear to damage any of the dozen towers or the structures that accompany them, Heppler said. It was being mopped up by 9:30 p.m. The storm cell didn't get here until 10:00 pm but there was still a lot of lightning with it. I sent a good portion of the night on fire patrol seeing if it started anything. There was a little moisture with it and I never did find any fire. I am worried about today though. When it warms up something could come to life. Damn lightning. Short couple hours of sleep. Hope nothing happens today. One of the crews vehicles that were in fighting the fire. The license plates indicate they are from the Bozeman area. 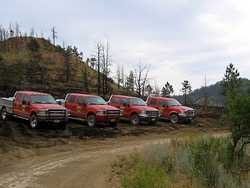 They were unable to use these vehicles because part of the fire was in such rough country they were up doing hand work. Taken 8/1/2006. One of the many slash piles burning late in the afternoon. Most of the smoke still visible was from these sources. They were letting them burn out. Taken 8/1/2006. I failed to mention it earlier. There was a large number of neighbors that responded to the fire yesterday and it is really appreciated. A community response to such things is important to the well being of all. I thanked everybody that was there and recognize and thank them here again. THERE IS A DAMN BIG FIRE OVER HERE AND IT IS REALLY BURNING!!!!!! I was out of here as fast as possible to get to the fire and see what I could do. It was 75 degrees still and by the time we got to the fire there was a stiff east wind blowing it towards my place at a fast and furious rate. The flames were leaping in the grass up to 4 feet tall and with my shovel and Pulaski there wasn't much I could do. The fire was reported in Indian Coulee but it was actually in the very head of Sarpy Creek across the fence from my place. The Northern Cheyenne fire teams started showing up at the same time I did and one of the bosses needed a local to show him around the fire in the dark so he could see how it was laid out and plan a way to attack it. Since I had no water I started running him around so we could get the crews fighting the fire. About the time we started finally getting the crews headed out to start fighting the fire the temperatures took a downwards turn and a little spit shower came up. It was the most amazing thing I had ever seen. The fire was burning in grass and old timber burned a few years ago and the increase in humidity with the little spit shower caused the fire to go from flames licking up 4 feet high to completely out within 20 minutes. The fire boss I was with said, "This change in Humidity is going to make us look like genius firefighters." It really showed me what a little difference a change in the humidity could make. It stayed fairly cool all day and the humidity has stayed up all day so they got all the way around the fire and got it out. We stayed there and made sure they didn't need anymore help and made sure they got it under control with enough crew for us to come home. When I left there was a fire crew from the Northern Cheyenne, a crew form Taos, New Mexico and a crew from the Bozeman area there. There was also 2 road graders and 3 crawlers there and a few other support pieces of equipment. I had guessed the fire size at 500 acres and finally heard when I left that they were calling it 350 acres. If that humidity wouldn't of changed we would have been in a hell of a pickle and been in real trouble but we were lucky. I guess I can't say I only have bad luck because this sure changed it. One of the guys up at the fire mentioned something that they have a policy now this year that the fire has to be completely cool before they demobilize from it. I will keep going up and checking on it but will leave the mop-up work to the professionals. I won't be comfortable if I don;t keep an eye on it but with that policy I shouldn't have to sit on it. I'll let them do that. One last thing. I am going to have to consider weaning my self from my caffeine addiction. Bolting out of bed and having to get going with out my dose of coffee in the morning lead me to such a sever headache that it wasn't even funny. It wasn't until I swallowed way more Excedrin Migraine (it has caffeine in it) than is recommended for one human being to take in a week that I finally got the headache under control. This can't be good for me. I'm not saying I am going to do it, but I need to think about it. I have a few pictures I will try to get up. I was busy enough during the fire I didn't get any of the active burn but got some afterwords. P.S. I want to thank everybody for their kind wishes. They are appreciated. Hi, this is Sam's Daring Wife. Sam is out on his way to fight fire this morning. It is over at what they call Indian Coulee. It is a ways for the houses but closer to some of the cows. I don't get over that way too often So I can't tell you too much. If you would all think good thoughts for him and everyone else to stay safe I would appreciate it. Thanks I am sure Sam will tell you more about it when he gets home. The cows are protesting the hay we are feeding. It's not good enough quality for them. I'll tell you, it's better than a snowball. Taken 12/9/2005.